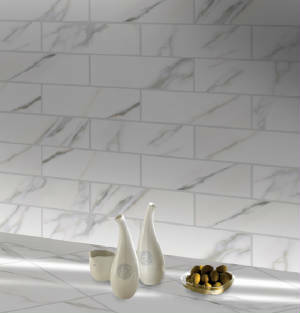 Johnson Tiles Vivid collection captures the vogue for vibrant statement colors to add impact and contrast to interiors. There are ten colors to choose from which have been specifically color matched to complement each other: Clay, Orange, Red, Lime, Blue, Teal, Purple, Gray, White and Black. Tones' subtle hues of soft greys, cream and mocha are perfect for creating neutral calming interiors. The collection is specificaly designed to be used throughout the home and includes 3-D textured tiles: Linear, Wave and Nano. To view more information about our Vivid and Tones collection, please click here. Our US website is designed to assist our retail distributors understand which of the thousands of Johnson products are available for quick delivery from the Johnson warehouse in New Jersey. But please do utilize the Johnson Tile web-site, newly redesigned with a fresh appearance, easy to navigate with many interactive features. Want to know more about the latest European design trends... follow the link for to hear the latest Inspiring ideas. Please note. All Johnson Tiles may be special ordered from the UK, with a typical lead time of 6 weeks from order date to shipment from the USA warehouse. Contact us on toffeeman1@aol.com for a delivered quote to New Jersey.We will help you locate a distributor or handle all the logistics for you. Natural marble, travertine and onyx have adorned interiors for over 2000 years, and now utilizing the latest "injket technology" we have captured their beauty to create the Elegance collection. Now in 10 different stone designs each with coordinating long and short side bullnose, the 4x12" size is a perfect complement to the existing 12x12", 12x24" and 12x16" floor and wall tiles. With a tightening economy Elegance offers a less expensive and easier to install and maintain version of the stones upon which it is modeled. To learn more about our new Elegance line, click here. Did you Know? Johnson Tiles were voted one of the top 30 companies in the Sunday Times Green Awards 2008 thanks to their efforts in issues such as recycling and energy saving. Did you Know? 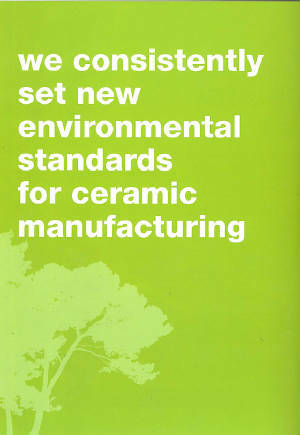 Over 25% of the raw material content of every UK manufactured ceramic tile consists of recycled material. Johnson-Tiles has recently formally changed it's name from H & R Johnson to simply Johnson Tiles. Johnson have presented in an easy-to-read format, it's award-winning Environmental Procedures, putting hard numbers to the initiatives designed to benefit Planet Earth. Literature detailing these procedures and initiatives is available here. BuildingTalk is hosting an H & R Johnson news feed, which is frequently updated and contains valuable information. To view the feed at BuildingTalk, just click here. Visiting London, England is always a great idea. In '09 Johnson opened a second location in Central London. Here designers can view the complete line including the new Absolute range.